Platform Shoes with big chunky heels have been all over the place this spring. I'm going to show you three different, yet almost identical shoes that vary greatly in price. I've had Jeffrey Campbell's Foxy Platform (as well as a few other JC shoes) on my wishlist for what seems like forever now. There are so many versions of this shoe. JC offers Foxy in various colors and prints (too many to name), different heels (wood, espadrille), and material (leather, suede, fur, etc). Pictured here are Foxy Wood in black. 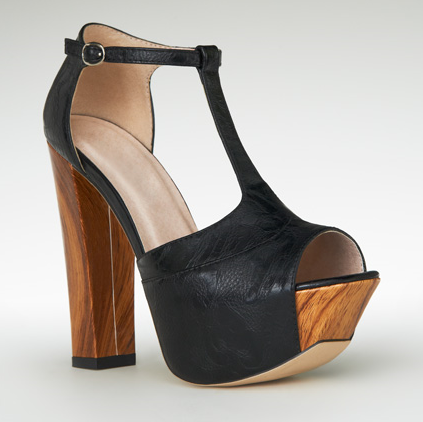 Jessica Simpson's Dany is an almost identical, and slightly more affordable version of JC's Foxy. Both of the above shoes are very hard to come by, especially in the popular colors (except in large sizes). Luckily, JustFabulous has brought us the Debbie shoe which is extremely similar to JC's Foxy and JS's Dany. Debbie comes in brown and black. If you are interested in purchasing this shoe from JustFabulous you'd better act fast because it is already sold out in certain sizes!